The Bankies moved up to second place in the league after despatching Budgie McGhie’s Kilbirnie Ladeside with *Little* difficulty. Nicky Little’s brace of goals in the opening fifteen minutes was enough to see off the challenge of the Ayrshire men who couldn’t have complained if the margin of victory had been greater. Kieran McAnespie went with the same formation which beat Kilwinning the previous week. The only changes being like for like with Michael McIndoe deputising for the absent Alan Vezza, and Chris Dooley taking over from Adam Asghar at right back. 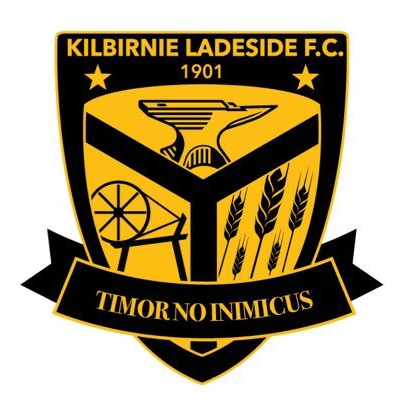 Kilbirnie are a team that have been on a level with the Bankies over the past few years and the head to head bears that out with the Bankies only ahead by one victory. Even last season there was nothing to choose between the sides as they both gained a win each in the league. This would be a good marker to see how the Bankies have progressed in the last year. 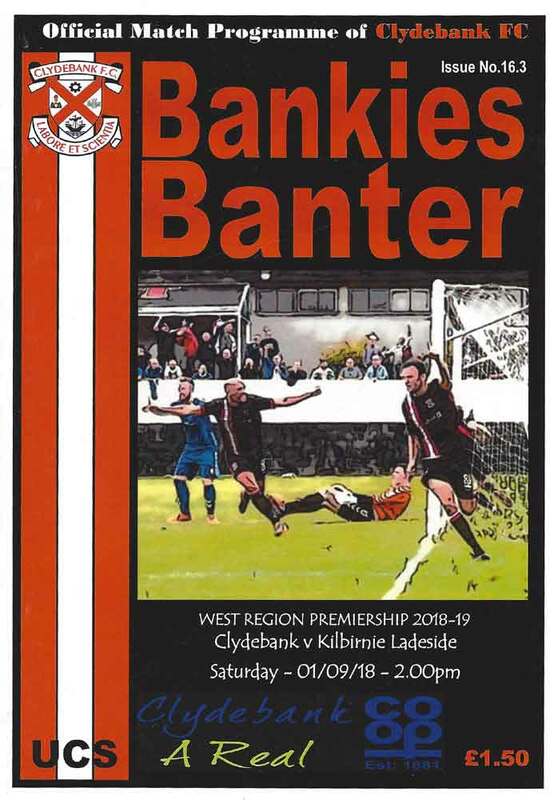 Last week, the Bankies faced a similar test against Kilwinning Rangers and passed with flying colours, and this was to be just, if not more so emphatic. Clydebank wasted no time in taking the game to the visitors and within two minutes the Ladeside defence was breeched. Nicky Little and Jordan Shelvey appeared to be playing keep ball as they swapped numerous passes before the latter played the former in front of goal on the right side and he calmly slotted the ball beyond the keeper in to his far corner. In fairness to Ladeside, they played at a fairly high tempo throughout the game, but didn’t offer much in the way of a forward threat. Scoring so early meant that the away side had to try and dictate the play, and the Bankies were quite happy to allow them to bring it to them. They did have a near thing after nine minutes when a dangerous ball bounced on the six yard line which was hooked towards goal by ex-Bankie Mark Burbidge, but luckily for Clydebank Marc Waters was well positioned and took the ball safely. It was to get worse for the visitors after quarter of an hour when Cammy McClair put the ball beyond the Ladeside defence for Nicky Little who timed his run perfectly and stabbed it past Hay into the net to make it 2-0. The rest of the first half was mainly about Kilbirnie trying to get themselves back into the game, having much possession but little else. My notes show that Marc Waters had not one save to make, and the only moment of any distress for the defence was when a corner kick had to be blocked at the near post and then blocked again on the rebound. The visitors made a much more concerted effort to get back into the game at the start of the second period, and did manage sight of goal. A corner kick saw a header by O’Byrne deflect off Jamie Darroch’s back for another corner, and a neat one two by Anderson saw his low shot sneak past the post. The Bankies stood firm for those moments and then started creating several chances at the other end that should have led to a much healthier scoreline. First up was Nicky Little after 59 minutes, who was the recipient of a slide rule pass by Cammy McClair. His left footed shot beat the goalkeeper but skipped past the wrong side of the post. Four minutes later the ref played a great advantage when Little was body-checked in the centre of the pitch. Jordan Shelvey charged towards goal, and his shot was tame as he came under pressure allowing Hay to make a comfortable save. Substitute Del Hepburn was next to try his luck with a volley shot from the left hand side of the box, but he got way too much on it and the ball sailed over the bar. The chances were coming thick and fast now as Little had a double opportunity to grab his hat trick when his header from a corner kick was blocked. He swung his left leg at the rebound but he somehow managed to put it wide. A minute later a short corner from Rowan saw McClair glance the ball wide of the target when he really should have done better. Then came the best move of the match with just under ten minutes remaining. Cammy McClair started it with a terrific ball down the right wing. Nicky Little sent over a super cross ball to the back post where Sean Higgins intelligently headed the ball back across goal into the path of Chris Black whose shot was well blocked by Hay in the Kilbirnie goal. McClair could have scored on the rebound but again the ball was turned away for a corner. These chances should have saw the Bankies over the hill and down the other side, but they were to get a major fright only a minute later when a superb cross ball from the right was met by Kasubandi right in front of goal. It was undoubtedly Kilbirnie’s best goal scoring opportunity in the whole mach, but the ex-Bankie somehow managed to head over the bar when it looked easier to score. Still, Clydebank had more chances to score in the closing stages. Stevie Higgins found Hepburn with a nice flighted cross from the left hand side, but the winger will be disappointed he didn’t make a better contact on the ball with his head as it drifted wide. We then had the spectacle of Sean Higgins trying to lob the keeper from the halfway line, which wasn’t a bad effort at all forcing Hay to desperately back pedal before he managed to keep the ball out. Overall, another top notch performance from the players, and I think most would have taken this start to the season if offered it. 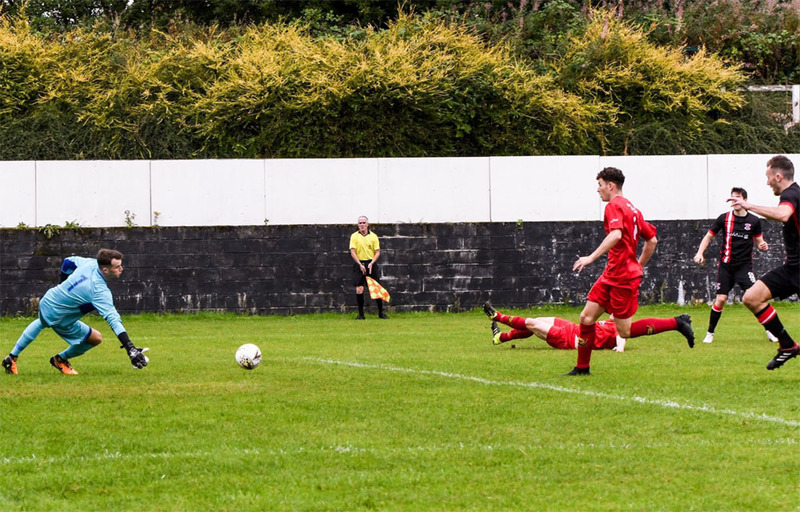 Kilbirnie put a lot into the game, but didn’t get much change from the Bankies defence and It would have been great if another goal or two could have been added at the other end, as it would have been well deserved. There is no doubt this formation is paying dividends. Little deserves praise for another great display, as does Darroch and Alexander. Liam Rowan had his best game in a Clydebank shirt yet and Chris Dooley now deserves a proper run at right back. The tough games keep coming with Glenafton and Hurlford in the next two weeks, but the players can certainly face these challenges with confidence after the last two results.